Half Irish teenage girl Rori Lane has moved to Tokyo to be with her Japanese mother. On her first day she encounters unearthly monsters who attack her, and a mysterious girl named Ayane who protects her. Rori herself seems to have some kind of supernatural ability, and now she needs to work out what's going in and how she fits in to it all before someone or something attacks her again. 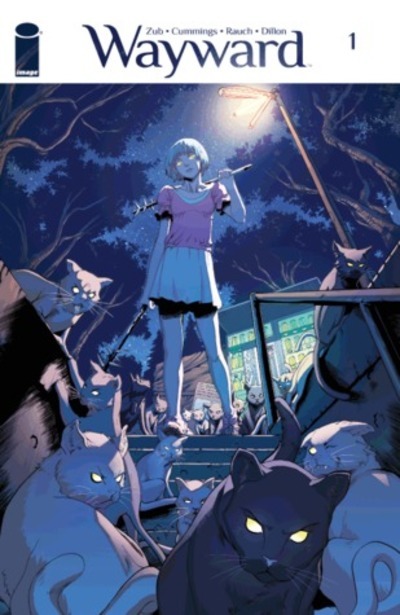 Billed as "Buffy for a new generation", Wayward does have a couple of things in common with Joss Whedon's series, in that it centres around a teenage girl with superpowers fighting monsters. However, so far there isn't an ensemble cast like there was in Buffy, with the witty banter and storylines about friendship and unresolved sexual tension that went along with that. The major difference is that it's set in Japan, with the monsters being based on creatures from Japanese mythology such as Kappas. Each issue will feature an essay about mythology and culture to help readers understand the context of the story, with the first one this issue being by Zack Davisson. The art has a heavy manga influence, which makes sense given the subject matter, but isn't really my cup of matcha. It should appeal to fans of anime and manga, who will probably dig the story too. It's hard to tell from just the first issue where the plot is going but I'm a little intrigued and will probably read on.